As mobile operators spar over 5G service names, our latest findings show Verizon continuing to lead 4G download speeds across the US. 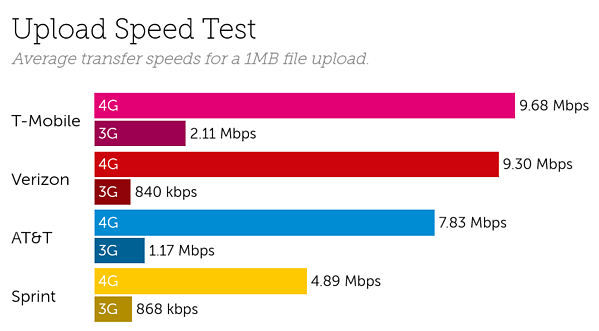 Our crowdsourced results from December, based on over 40 million speed tests, also show T-Mobile performing best for both upload speeds and latency, with some regional differences, most notably in California and Texas. Tutela tests mobile networks in a way that represents the day-to-day usage and experience of real-world mobile users. We do not measure network speeds under optimised testing conditions such as with very large file sizes or with optimised test servers. Our methodology and configuration simulate typical user mobile behaviour, such as accessing websites or downloading and sending images, rather than the more traditional testing of peak mobile network speeds which few users will experience when using the majority of apps. Verizon lead 4G download speeds across the US with average speeds from December of 20.83 Mbps, collected from more than 2.5 million speed tests on the Verizon network. AT&T place second in our ranks, averaging 14.83 Mbps, followed by T-Mobile and Sprint, with average results of 11.10 Mbps and 9.25 Mbps respectively. Our results show a similar pattern in Texas, Florida and California - where Verizon averaged the fastest download speeds in our tests of 24.07 Mbps. In a tight race and with average results of 9.68 Mbps, T-Mobile demonstrated the fastest 4G upload speeds of the four operators in the US. Verizon sit just behind in second place, averaging 9.30 Mbps, ahead of AT&T and Sprint with results of 7.83 Mbps and 4.89 Mbps respectively. Our findings for the the US are based on 213 billion network quality measurements including 40.9 million speed tests in December 2018. Our latest complimentary Mobile Experience Report is available to download from the Tutela Insights portal. Access Tutela Insights to view this complimentary report in full and subscribe below to get our latest insights in your inbox each week.